Nestled just north of the state’s capital city, the City of Ridgeland MS is a safe haven for individuals and families seeking convenient access to the vibrant economy and rich cultural tapestry of Mississippi’s largest metropolitan area. 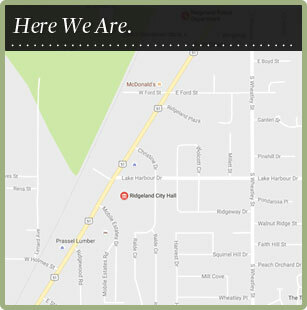 By and large, Ridgeland residents prosper in a community that offers the best of both worlds. A robust economy combines with a small-town way of life to make Ridgeland perfect for business and for family. In Ridgeland, you can enjoy a close-knit community and family-oriented neighborhoods. Sizable parks and plenty of recreational opportunities bring individuals and organized groups together outdoors for the benefit of their health and social interaction. Education is highly valued in Ridgeland where we boast Star-Rated schools within the Madison County School District as well as a community college and private schools. Ridgeland is recognized in the South for its fine shopping and delicious dining. Community events, vibrant entertainment, and festival fun are part of the Ridgeland experience. An enthusiasm for art and culture, history and heritage, and fitness and sports is evident throughout Ridgeland. Local organizations are an integral part of community life in Ridgeland. From the Chamber of Commerce, Historical Society, Bicycling Groups, and so much more, be sure to find your way of getting connected. With a warm climate and plentiful sunshine nearly year round, our numerous parks and outdoor recreation areas are magnets for active people young and old. The Natchez Trace Parkway, a picturesque 444-mile National Park, runs right through Ridgeland. The Park is easily accessible and our newly expanded Bike Trail travels 10 miles along the Parkway from the Ross Barnett Reservoir Overlook to the Renaissance shopping center. The 33,000-acre Reservoir is perfect for sailing, boating, fishing, and just enjoying the view. And our city parks—Freedom Ridge Park, Friendship Park and Wolcott Park—have playgrounds, fitness trails and sports fields. The 17-court Ridgeland Tennis Center is also open to the public. Here in Ridgeland MS, we’re all about family, fitness and fun!